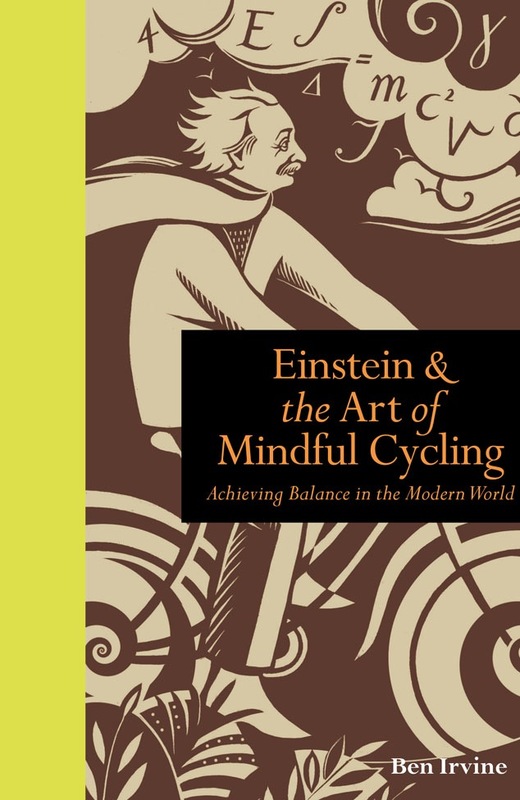 In a shameless bit of self-publicity passed off as news, I’m delighted to announce that my book Einstein and the Art of Mindful Cycling (Leaping Hare Press) has gone to a second print run. Reviews of the book have mostly been generous, but it was the above commendation from inspirational author, TV presenter and cyclist Rob Penn which really got me smiling. Cycle Lifestyle 9, this summer’s issue, is still available to read on the homepage of www.cyclelifestyle.co.uk or to download (along with all our back issues) here. But we’re already gearing up for issue 10, which will be publishing this autumn. If you’ve got any great ideas, or suggestions for how you might get involved, please do get in touch on info@cyclelifestyle.co.uk. If you’re an advertiser who wants to feature in 20000 copies of Cycle Lifestyle magazine, reaching schools, cafes, bike shops and more all over London and beyond, then check out our media pack and get in touch. The road-based route of the Great British Bike Off has been designed to take in the best of British countryside and will pass through some of our most beautiful landscapes. Why not get a team of up to five friends and colleagues together and take part? There are plenty of mini challenges and fantastic prizes up for grabs along the way. This event has been designed for cyclists of all abilities so whether you’re looking to improve your fitness or you want some friendly competition with friends and colleagues, join us and make a real difference to the legacy of our waterways. Our route will start at the Olympic Park in East London and will cover 300 miles over four days. We will cycle along roads making this route ideal for road bikes, aiming to complete between 60 and 90 miles of cycling each day, making overnight stops in Towcester, Stafford and Stockport until our final destination of the Anderton Boat Lift in Northwich. The route will see us cycling through magnificent countryside parallel to waterways, such as the Grand Union Canal, the Trent & Mersey Canal and the Macclesfield Canal. 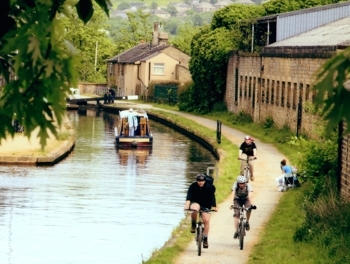 Included in this route are several structures such as the beautiful Hatton Locks and Standedge Tunnel. We ask every team to raise a minimum of £5,000 which will cover the costs of accommodation, meals and full support on the ride for up to five team members as well as generating funds for our vital work. We’ll provide you with a fundraising pack and training advice to help you get ready. Costs of participation are £600 per person and if you or your company cover the costs yourself, every penny you raise will go directly to our charitable work. The money you raise will help us to care for our nation’s canals and rivers, which are a key part of our British heritage and enjoyed by over 11 million people each year. With your help, we will be able to ensure that our Waterways remain safe, clean and accessible for everyone for generations to come. This is a fantastic opportunity to discover Britain’s beautiful countryside, and the waterways we are dedicated to preserving. One of the perks of being editor of Cycle Lifestyle is getting invited to industry events. Last week, I attended a press event organised by Halfords, the biggest cycling retailer in the UK. It shows how far our magazine has come that we were among a handful of ‘key media’ invited to a hotel in the Cotswolds where we were presented with Halfords’ latest business initiatives in the cycling sector. As ever, I banged on about the importance of encouraging would-be cyclists, but I was reassured by everyone I spoke to at Halfords that their ‘core customer base’ is ‘family’ cyclists, including ‘kids’ and the ‘mass market’ (which comprises customers buying bikes for £400 or less). Halfords offer regular instore workshops for kids, and have created a shiny new website that features product videos and easily comprehensible specification lists to simplify the information available to newcomers. It turns out that Halfords are focusing their growth strategy on converting new cyclists into enthusiasts. Nothing wrong with that – the more keen cyclists there are, the more they’ll tell their friends, and the more mass cycling will be catalysed. With a drive towards accessories and parts (culminating in an impressive 15,000 product lines now available), an expanded range of higher-end bikes, next day delivery promised, and a renewed emphasis on service and repairs, Halfords are really upping their game to meet the demands of the cycling revolution which is currently sweeping Britain. I had some interesting discussions with senior figures at Halfords about how to market cycling to would-be cyclists. I don’t think any cycling company has truly cracked this nut. The industry still, to a large extent, relies on a stream of new cyclists arising exogenously without necessarily coming up with a dream slogan for encouraging cyclists to give it a go. Granted, the Cycle to Work scheme provides a financial incentive, but that’s not the same as really getting into people heads and inspiring new cyclists. Crucially, I don’t think any company has devised a slogan that stops people being afraid of cycling. With the ultra-refined persuasive techniques of modern marketing, you’d think this could be done by someone, somewhere. In the absence of this golden ticket, it seems like companies are fighting over the next best growth area, selling better bikes and fancier accessories to newly established cyclists. Anyway, having thrown that gauntlet down, I must say it was a pleasure to meet the team at Halfords, and to witness their extremely hard work, which is bringing affordable and quality cycling products and services to millions of Britons. 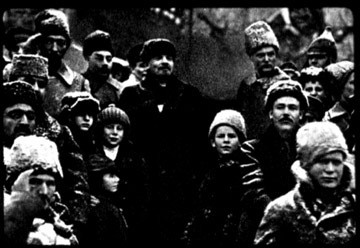 The first was way back in 1923. Now, Bike Week is one of the UK’s biggest annual cycling promotion events. This June (15-23) will see Bike Week 2013 taking place. As the nation falls in love with cycling, this year's Bike Week will offer inspiration and practical help, hoping to inspire new and lapsed cyclists alike. Bike Week 2013 will focus on providing advice for every budget. There’ll be guidance on where to buy a bike locally for everyday use, or a low cost option via a great bicycle recycling scheme, plus advice on how to patch up an old bike. Dr Bike specialists will guide cyclists on how to mend and when to spend. Recent research shows that at least four in ten Brits now cycle. With newly released government plans for improved infrastructure and training, Bike Week hopes to capitalise on these incentives to help get many more people back on two wheels this summer. A cracking job opportunity has arisen within the NipNip team, which is directed by entrepeneur David Farr. See below for details and a contact address for those who wish to apply or find out more. Do you want to earn more £££’s than you’ll get elsewhere? Only the best will do as we need exceptional people to join the one of the fastest growing companies in the cycling industry in London. NipNip is an independent company based in Central London. We have a vacancy for a workshop manager for our busy and rapidly growing operation. We work on all brands of bikes and pride ourselves in providing a seamless service with excellent customer service. The workshop manager will be responsible for day to day management which includes improving performance, maintaining excellent customer service, controlling stock levels, and liaising with other members of the team. You must have exceptional current product knowledge, be able to think on your feet, and be quick and efficient in servicing bikes with your decisions. You have to be self-motivated and decisive. The candidate must have a minimum of 5 years previous workshop experience (ideally with workshop manager experience) with a minimum of Cytech 2 qualification or equivalent thereof, have a keen interest in cycling, and be a great team player/leader. - Organising rotas, training and motivation. - Good communication skills and fluent English is essential. - Stock control - ordering and maintaining stock levels. - Product knowledge - must keep up to date with new products and provide staff training where necessary. - Bringing new ideas to the table for promotions, events, etc. - Attending community and business cycling events. We offer a package that you will not get elsewhere, including bonuses, staff discounts and the opportunity to work within the best team in the industry. If you think you have what it takes then please forward your CV to enquiries@nipnip.co.uk and tell us why you think you would be a great addition to the NipNip team. First they invented the wheel. Next they invented the bicycle. Now, two major cycling organisations have once again announced an historic breakthrough in transportation. The invention of a network of cycle routes for the capital promises to encourage locals and visitors to make more journeys by bike. Narrowly ahead in proclaiming this great leap forward was Sustrans with their campaign for a ‘Connect London Network’. 'You heard it here first', says their website proudly. But with special added features including ‘Quietways’, ‘Superhighways’, and the ‘Bicycle Crossrail’, it is Transport for London’s ‘Central London Grid’ which has really made the headlines. The public will no doubt soon be calling it the ‘Boris network’. Not all commentators, however, have been so impressed. There have been murmerings that a London Cycle Network was invented decades ago. There have also been reminders that millions of pounds have already been spent developing this network, giving it a range of thousands of kilometres. Some sceptics have even alleged that this development is ongoing. There is talk, for instance, of a truly groundbreaking ‘London Cycle Map’ to improve navigation and safety for people using the London Cycle Network (although even this map seems to have been re-invented). 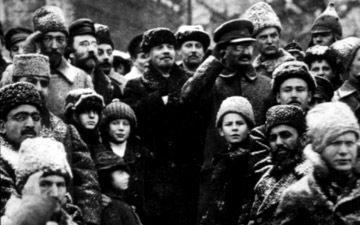 For now, though, the national mood is one of elation. In celebration, Cycle Lifestyle magazine is running a spot the difference competition. Cycle Lifestyle, the free cycling magazine that lets non-cyclists in on the deal, returns for a ninth issue. 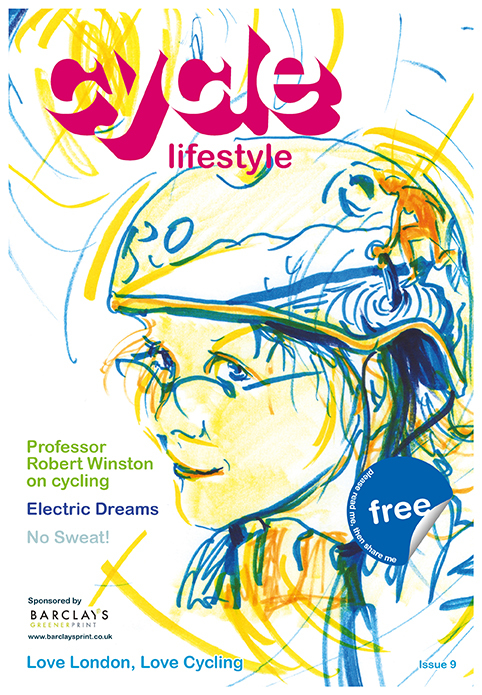 Featuring a beautiful poster, an interview with Robert Winston, tips on getting started, advice on how to avoid sweating, musings on long distance cycling, Give it a Go, a grumpy Peddler needing a hug, cycle poetry, the New Bike on the Block, and an e-bike adventure, 20,000 copies of this summer’s issue of Cycle Lifestyle have been delivered all over London and beyond – to schools, doctors surgeries, workplaces, cafes, student unions, cycle shops and more. Our print run included bespoke versions for a record FOUR London boroughs – Barking and Dagenham, Haringey, Lambeth, and Redbridge. And we’re delighted that for the first time we created a special issue of the magazine for a local authority outside of the capital – Birmingham City Council. The publication of Cycle Lifestyle issue 9 also coincides with a major upgrade to cyclelifestyle.co.uk. The old website was like an old clunker – loved but knackered – so we’ve rebuilt it on a new platform. Let us know what you think. Thanks to everyone who helped us out with this issue of Cycle Lifestyle. If you would like to contribute to future issues – whether through writing, illustration, handing out copies, advertising, or anything else – please do get in touch on info@cyclelifestyle.co.uk. Enjoy your summer of cycling. Read more about Cycle Lifestyle issue 9! Due to the activities of some hackers (that's the polite, non-technical term for them), the old cyclelifestyle.co.uk website had to be deleted and completely rebuilt. You might have noticed a ton of spam comments on the old site - all part of the fatally compromised security caused by the hack. You might also have noticed that I haven't posted here for a while - things got so bad that I couldn't update the site or even delete the spam comments. Well, the good news is it looks like we're up and running again on a shiny new platform, in large measure thanks to the help of my talented friend Jack Carr. It'll take a while for me to fix all the internal links. And the blog is currently in a state of semi-chaos, with loads of repeated entries and random content from yesteryear that has been carried over from the old site - plus the old comments need to be put back in. It should all be fixed in the next few days. Until then, please bear with us. The really good news is we've fixed the site just in the nick of time. Cycle Lifestyle issue 9 is publishing this week. Watch this space. London Cycle Map success... sort of. The Mayor’s recently published ‘Vision for Cycling in London’ indicates that Cycle Lifestyle’s London Cycle Map Campaign is beginning to influence cycle policy in the capital. As part of an increase in funding for ‘routes, junctions and suburban cycling improvements’ (from just under £120m to between £550m and £600m), Transport for London (TfL) is promising a ‘Tube network for the bike’, consisting of ‘direct, high-capacity, joined-up cycle routes’. Some of these routes will feature new segregated cycling facilities, while others will be on designated ‘Quietways’ using backstreets or green spaces. The network will also include a central London ‘Bike Grid’ and a ‘Crossrail for the bike’, that is, an East-West Cycle Superhighway. Threading these promises together are two further, interlinked TfL commitments. There will be ‘easy-to-follow diagrammatic Tube-style cycle maps showing the major routes and the interchange points between them’, while all routes will be equipped with ‘far better, more frequent signage using consistent typology across London’. It is strange that TfL has not explicitly suggested making use of the routes of the old London Cycle Network, on which over thirty years and hundreds of millions of pounds have already been spent. That’s just politics – the old London Cycle Network is dead, long live Boris’s new London Cycle Network. In short, it all sounds like good news for the London Cycle Map Campaign, which has been calling for a Tube-style map and network of cycle routes accompanied by road signs and markings in the capital. But there is a long way to go before the campaign can declare victory. For one thing, there is very little detail in the Major’s ‘Vision for Cycling’ about how the routes of the network will be coded and organized. If this is truly to be a city-wide network, how does TfL plan to consolidate and represent potentially hundreds of routes as a single network? With all the options TfL are proposing to employ – segregated facilities, Quietways, Superhighways, the Bike Grid, the bicycle Crossrail – the resulting ‘network’ may turn out to have a cobbled-together feel, and this won’t provide the ease of navigation which is so needed in a metropolis like London. (TfL’s mention of ‘Tube-style cycle maps’ – plural – compounds this worry.) Will TfL be able to ensure that cyclists can ride from anywhere to anywhere in the capital, on properly provisioned streets, by remembering and following no more than a handful of coloured routes, as Simon Parker’s single London Cycle Map would achieve? When it comes to coding and organizing large numbers of cycle routes, Parker’s Compass Colour System remains the only game in town. A further worry arises from TfL’s mention of ‘orbital routes’. Although Parker’s network features one orbital route, all his other proposed routes are long, straight and direct. As Parker recognizes, cyclists naturally want to travel in straight lines. It is not clear that TfL’s commitment to direct routes is as rigorous. A related concern arises from TfL’s promise to create cycle routes which ‘align with the maps Londoners carry in their heads, the most common of which is the Tube map’. This will involve creating cycle routes which are ‘where possible, in rough parallel with Tube lines’ as well as with ‘bus routes, and major roads’. It seems fair enough to want to ensure that the cycle network links properly with major transport facilities and arteries. But at the same time it is arbitrary to restrict the network in this way. In contrast, Parker’s London Cycle Map (incorporating, as it does, the old London Cycle Network) is comprehensive, catering more or less for the whole of the capital and all journey trajectories, not just those which mirror the current infrastructure. This seems the more sensible priority. Where the network cannot be made to link with major hubs and arteries directly, subsidiary ‘grey routes’ could achieve the required connections. These grey routes could also be used to link the network to tourist attractions and major landmarks. A conference is scheduled this week with London’s Boroughs, during which TfL aims to discuss route choices for the network. Unfortunately, no-one associated with the London Cycle Map Campaign has been invited. Clearly, some people are better at networking than others. Read more about London Cycle Map success... sort of. Rosie Swale-Pope MBE - author, adventurer and marathon runner - will be speaking for the benefit of Sustrans next week. Rosie is the only person in history, man or woman, to have undertaken an epic solo, unsupported run around the world - over 20,000 miles facing extreme danger, bitter Siberian winters, wolves, axe-men and desolate loneliness over nearly five years. She raised £250,000 for charity and highlighted the importance of early diagnosis of prostate cancer, following the death of her husband. Rosie's other achievements include sailing single-handedly across the Atlantic in a small boat, and trekking 3,000 miles alone through Chile on horseback. Tuesday 12th March 2013 at Euston Station Property Maintenance Room, London NW1 2RT. Doors open 6 p.m. and the talk starts 6.30 p.m. Refreshments will be available. All proceeds from ticket sales will go to Sustrans. *IMPORTANT* Please print out your email confirmation as this will be your ticket for entry to the event.